American farmers say they are facing a severe worker shortage. More than half of U.S. farm workers are undocumented immigrants, according to the U.S. Department of Labor. Yet, that pool of workers is shrinking. A recent Pew Research report found that more Mexican immigrants are now leaving the U.S. than coming into the country, citing tougher enforcement of immigration laws and the slow economic recovery here in the U.S. (The report accounted for both documented and undocumented immigrants). With fewer workers, farm owners say costs are rising and they often must leave unpicked fruit to rot in the fields. Many producers are even opting to leave the U.S. for countries with lower costs and fewer regulations, said Tom Nassif, CEO of Western Growers, a trade organization that represents farm owners both in the U.S. and abroad. "We're pretty much begging for workers. It's very bleak," he said. The competition for workers has sent average farm worker wages up 5% in the past year, to $12 an hour, according to the U.S. Department of Agriculture figures. That's $2 higher than California's $10 minimum wage, with some farmers saying they pay as much as $15 an hour, according to Nassif. 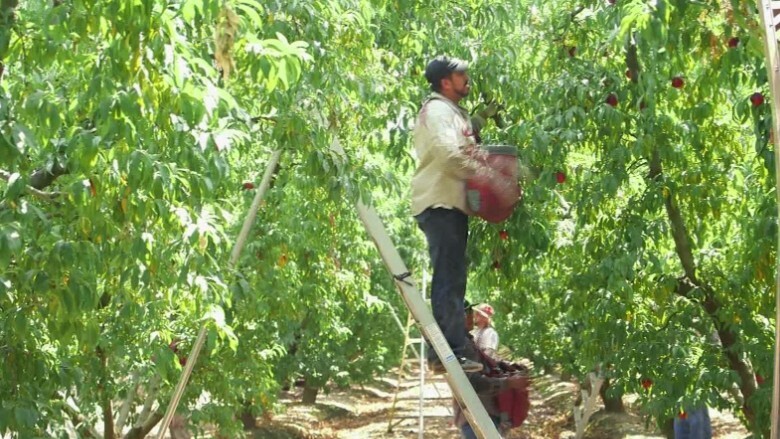 A fruit picker balances on a ladder. And costs keep rising. Two weeks ago, California said it will expand its overtime rules to include migrant farm workers starting in 2019. That means farm owners will have to pay one and half times the employee's regular rate after they have worked a certain number of consecutive hours. With increased competition for labor, workers are also asking for and winning better working conditions, such as a 15-minute shade break for each hour of work. "If they don't like how they're being treated or what they're being paid, they'll just go to another farm," said Nassif. Still, the increased pay, improved working conditions and overtime benefits have failed to attract many American workers. "Of the 300 workers I have in the field, two are Americans," said Joe Del Bosque, a farm owner in Firebaugh, California. One big reason: The work can be very labor intensive, said Nassif. Picking strawberries, tomatoes or melons requires bending down or kneeling all day. 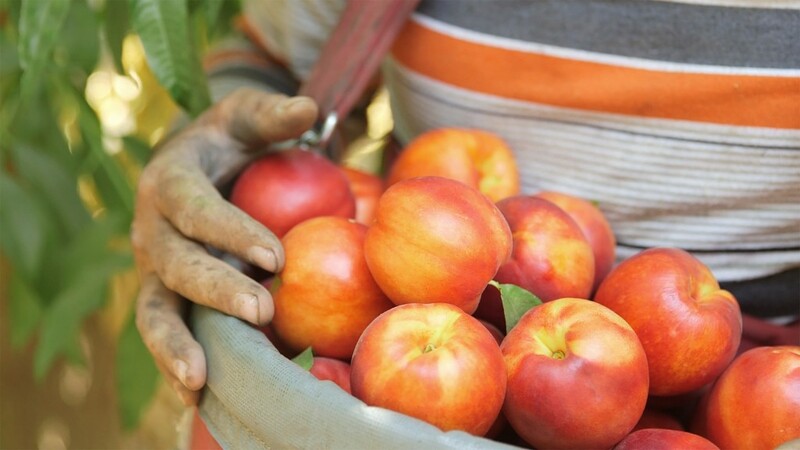 Picking tree fruits, like oranges and peaches, means carrying 10- to 20-pound bushels while balancing on ladders in all sorts of weather conditions. Jorge Negrete, a formerly undocumented immigrant farm worker who is now a citizen and a farm manager in California, says that of the Americans he's seen come to work on the farm he manages, few stick around for more than a day. But it's not just the physical labor that's problematic. It's the seasonal and migratory nature of the job that's likely a deterrent, Nassif said. "If you told Amazon delivery people that every several weeks or several months they'd have to move to a different city or county, I doubt that they'd be working for the company," he said. "Americans want stable jobs with vacation and other benefits. That doesn't exist in agriculture." The only way Nassif believes American workers could be enticed back onto the fields is through the use of technology, like crop-picking robots, he said, where they would be able to put their higher educations as engineers and technicians to use. But he noted that advances have been too slow and not enough money is being invested into research and development. 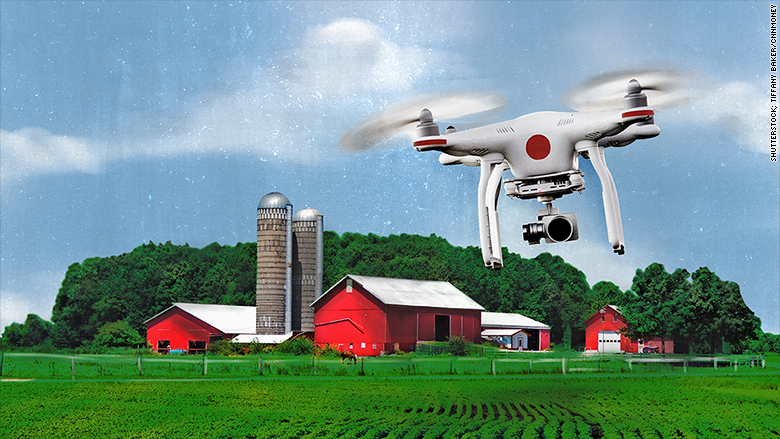 More farms are using drones to monitor crops. "Millions of dollars are being invested into this technology, but it should be in the multi-billions," Nassif said. Western Growers has created a center for innovation and technology in Salinas, California, to develop new technologies like these. The organization also brings in entrepreneurs to work and meet with farmers who would buy or invest in their technology. It also brings in venture capitalists and creates funds for investors. "That's where we see the future," Nassif said. -- CNNMoney's Cristina Alesci and Logan Whiteside contributed to this report.